Dimensions: 6 x 8-1/4 in. 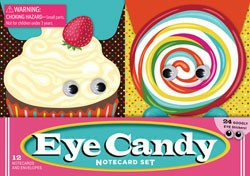 Includes: 12 die-cut notecards (4 designs repeating 3 times), 12 envelopes, and 12 pairs of googly eye stickers. For ages 3 and up. For the cutest correspondence ever, this notecard set features cards die-cut in the shapes of adorable sweets, plus 3-D googly eye stickers to adorn them with.